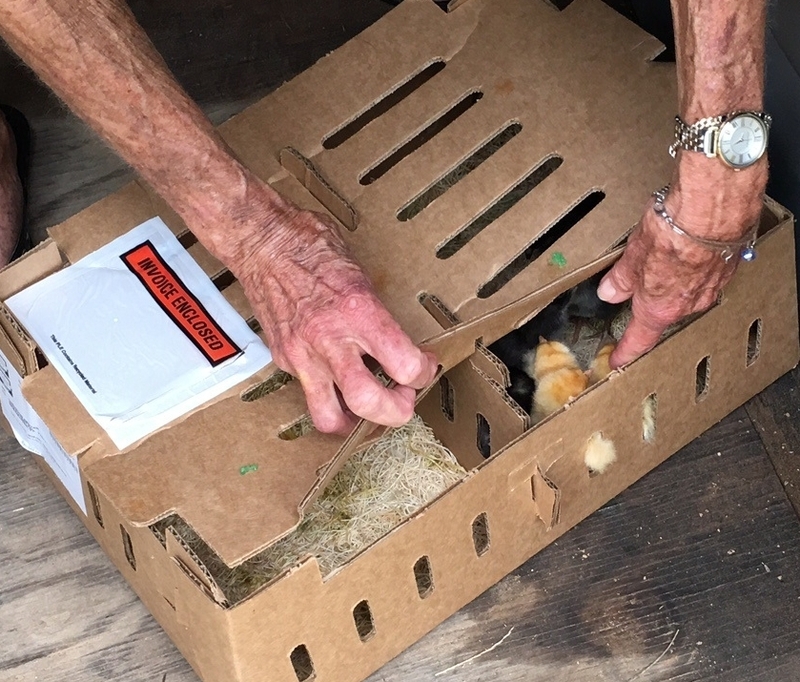 When my mom and I were scheduling their first trip to the ranch, I told her that it was going to coincide with the arrival of the new chicks we had ordered (after having dealt with the predator problem that decimated our original layer flock). I explained to her that they arrive as day old chicks at the local post office and we have to pick them up and settle them into the brooder at the ranch. Her response was, "I've never done that before! How exciting!" On the scheduled delivery day, Mom and I woke up early in the morning to be at the post office just as they opened to pick up the chicks. I've ordered from this hatchery several times, and the chirping box always arrives early the following morning, 24 hours after they've hatched. We watched the mail delivery truck arrive and unload, but there was no chirping box. The kind postmaster assured us that he would call us if the chicks arrived in the later truck which would arrive around noon. Disappointed, and a little worried for my new chicks, Mom and I went back to the ranch and had our breakfast. We were had just finished washing the breakfast dishes when my cell phone rang. It was the diligent postmaster informing me that the truck had arrived early and my chicks were there. I could actually hear their chirps in the background! This time around, I took my stepdad with me to the post office (mom was insistent that I show him no more than what I showed her on her trip). Making sure I followed the same route and steps, we retrieved the chicks from the postmaster and returned home. Mom, stepdad and I proceeded to get our chicks settled in their new brooder. This time around, we placed the brooder in the workshop to safeguard them from any sneaky predator. I instructed Mom on how to dunk their beaks into water to force them to have a sip and then place them into the brooder. Stepdad was in charge of documenting the occasion, as he's always been the designated family photographer. Together with chick starter, I give the chicks slippery elm powder for the first few weeks at every feeding. It has anti-inflammatory effects and stimulates the digestive system. It also helps prevent coccidiosis. 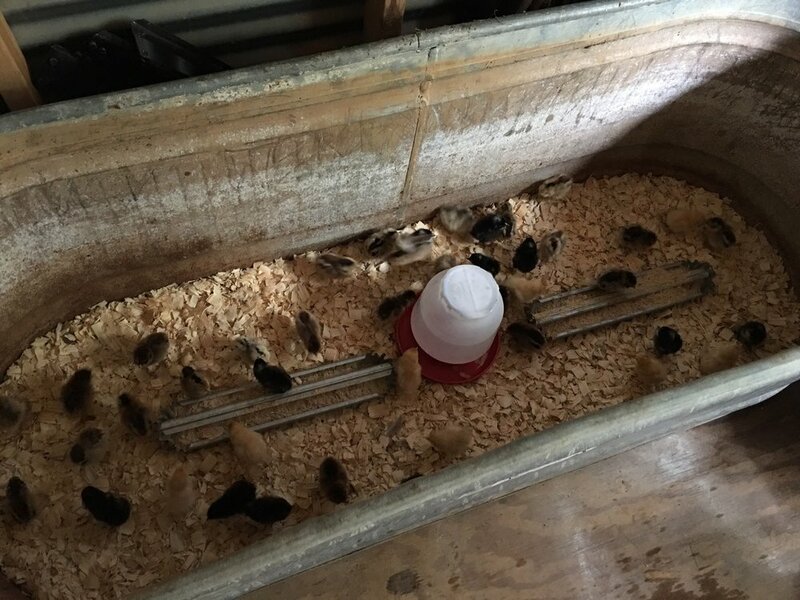 Because these chicks had a longer than normal transit time, I wanted to make sure that I treated them for stress and fatigue with the slippery elm powder. I didn't do this on this batch of chicks because I just didn't get around to it, but I also give the chicks a stinging nettle tea. This tea is a natural electrolyte mix. I mix the tea with a little honey (making it a little more palatable) and use that for watering my chicks when they first arrive from the hatchery. Going forward, given the amount of stinging nettles I've got around the ranch, I should have no excuse in doing this. Lastly, a friend told me about using Rescue Remedy Bach Flower Remedy on the chicks and chickens. A couple drops in the beak or dropper full in the waterer can make a huge difference in how well your birds do overcoming a stressful situation. I used this on the surviving two hens after the predator attack to settle them down, and it was extremely effective! Given the long transport time for this batch of chicks, I gave them Rescue Remedy as a precaution to settle them once home. On our weekly call, mom always makes sure to ask about 'her' babies are doing! She's become quite protective over them and insists on particular details on their growth. I'll have to break it to her gently when they get moved out of the brooder into the outside big world of the ranch pastures into their chicken tractor! Want to hear more about our chicks? Click below and subscribe to ranch updates, product announcements, special events and receive our special gift!